Due to the development of smartphones more and more applications get created specifically for mobile devices. Therefore, developers search for tools that will provide maximum efficiency and quality. Also, it is preferable that tool is ready for scalability and carrying out all operations immediately. One of the problems faced by many developers is database. Realm is chosen as a mobile database, because it perfectly combines all features required for the convenient development of applications. Our team loves to work with it. However, we found that it is rather inconvenient that Realm browser is available only for Mac OS X users. Therefore, we decided to fix that problem! Our team created Realm Browser Library. 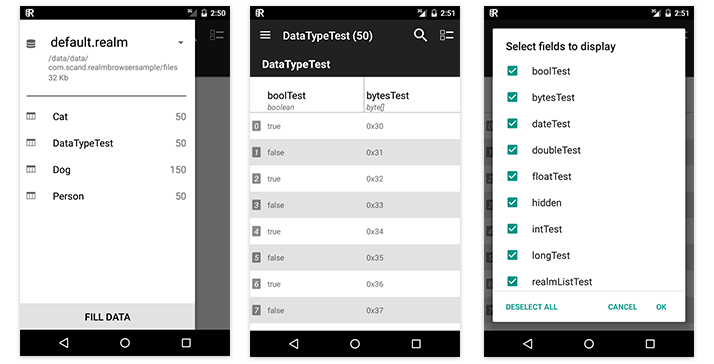 It is a small, but very helpful library designed for viewing and editing Realm database files on Android devices faster and easier. Using Realm Browser Library developers have an access to stored data directly in the program without having to copy the data file. Library also provides the ability to generate data automatically. Call the appropriate method at the right time. First method prevents interference in your app’s user interface, while the second one provides necessary flexibility. Recently, we launched a new version of Realm Browser for Аndroid with fixes and improvements. It comes with a more attractive UI for better user experience. You are welcome on the product page where you will find the details and links to download the library.